NOTE: Anna and Elsa appear in the same room, but separate photo spots. *All entertainment is subject to change without notice. *Arrive early for the most popular characters as sets may be cut well ahead of time. Use my custom designed Epcot Character Location Map to find your favorite characters! To access FULL character schedules and interaction tips designed for mobile access, subscribe to CharacterLocator.com! Is there ever a listing for when Figment will be doing an appearance? Is this a change? Above you have it listed that Baymax does sign. Training meet, wouldn’t be listed here. kenny is joy and sadness still meeting ? also is there a chance of bing bong coming to disney world? I would love to meet him. thanks! I just noticed something and was hoping you could help me translate it. MDE has Sadness listed at the World Showcase Ambassador Gazebo instead of with Joy at Character spot. Is this just a one off thing or are they maybe getting to change up the Character spot again. Personally, my kids and I would love it if Nick and Judy got a spot over there. We are going to WDW Feb 25-Mar 5 for our first full Disney trip and your site and the Character Locator app have been a major help in planning. Kenny, does this mean that Aurora is meeting again at Epcot? I had seen your news earlier in the year that she was removed from France, but saw her listed in Character Locator and here. Would love to meet her in this setting. Thanks! Does Baymax, and soon to come (if not already) Joy & Sadness, meet duriing EMH – either morning or evening? What is a training meet and how ogten do they happen? Click on Epcot Training for that info. The my Disney experience app says there is a character meet and greet at legacy park west @ 8:30. How is this possible when the park opens at 9:00? If it says the last meeting times are at ‘16.35’, how long after that can we expect the characters to stay? Not sure where you see 16.35? We’ve met Ariel (with legs) and Mulan together in Future World. The last time this happened was July 2014. Is this not common? And I shouldn’t depend on it when we go in October 2015? If two children have a Fast Pass for a Character Spot, is it allowed to one parent without a Fast Pass to accompany them? If 2 children (Age 5 and 8) both have a Fast Pass for the character spot, is it possible that one parent without a Fast Pass can accompany them to take pictures? Thanks for an answere! Are the Three Caballeros ever out to meet? Hi.. does Stich only stay around the Polynesian Resort ? No other ways to meet him? Thankss for any input. Any rumors about a temporary location for the Visa Meet & Greet while Innov West is closed? Posted about it the other day. Staying where it is for now. Has the Visa character meet spot been moved? I saw that Innoventions West closed down. No, I just posted about it and Innoventions West closes on the 29th, so not sure what reference you used for that information. So, does Belle take pictures in France? Are the characters still out during Extra Magic Hours from 9pm-11pm? I was thinking Mickey/Minnie/Goofy might be, and this might be a really good time to go, any others do you think? Thanks!! How early should one line up to meet epcot WS characters like Mulan/belle/mary poppins? for example,it says that mulan’s meets are hourly from 11am-4pm. how long does she stay out for each meet? so if we wanted to see her at 2pm,what time should we get there? just trying to plan out our day and fit these in, which is more challenging than I thought! Mulan would have the longer line, so go there first. If you wanted to go to a 2pm meet, you should arrive by 1:45pm Length of each meet is listed out on http://www.characterlocator.com Mulan is 35 or 40 minutes depending on session. When are Anna and Elsa returning to the norway pavilion in their new meet and greet? Will they be back for Christmas? I saw on the Disney website that the World Showcase meets weren’t listed during Christmastime. Do you know if characters like Mulan will (or have in past years) still met in December when they’ve got the Holiday Celebrations going on? Have Ana and Else moved the Norway Pavilion yet? We are visiting in November. I just want a back up plan in the event we miss them in the MK. Thanks! Great site. We will be in the parks this week. Has anyone had success meeting characters at the Epcot training spots? If so who, where, & what times? Can Peter Pan be found in any other park then just Magic Kingdom? We will be going September 6th through the 13th and I love peter pan so I was just wondering. We’ll be at Disney in Oct. with our girls ages 2 & 5. We won’t be able to dedicate a whole day to Epcot, but we plan to be there two late afternoons /evenings. I’d like to try to see half the World Showcase characters each day. Do you have a suggestion on when we should try to arrive? I know the characters stop meeting fairly early. My oldest especially wants to see Jasmine and Mulan since those are princesses she’s not yet met. You’ll need to arrive early before any meet you choose. The afternoon meets usually fill before the character even arrives. Thank you so much for this website! I saw one of your tips on how to stack fast passes for different times and have them overlap, and my little sisters and I will get to meet Anna and Elsa in June! This is the best Disney site I have ever found. Please could you tell me which characters were at epcot in the Norway area before the characters from frozen were there. Do you have any idea whether Anna and Elsa will be around after January 1, and if so where? We have added an Epcot day onto our trip just to meet them in early February, so I’m hoping they stick around! They will definitely stay through jan in current location and they are looking at another spot in Norway to continue after that. I too am looking for more information about Remy’s departure. A friend has a reservation on 10/25 and was hoping to see him. Is the last day 10/24 or 10/25? I’ve heard that Little Chef Remy’s last day is October 24th, but I will confirm this tomorrow. Kenny, can you comment on the rumour that Remy is leaving Chefs de France? Of course, his last day is supposed to be the day before I leave to come to the World. DRAT!! I am really hoping the rumours are wrong. I have a reservation for lunch there that I will be cancelling if he’s gone. Might as well put my money where my mouth is. Any updates on who is at the Character Spot? I see the wait times are long and wondering if I should use one of our golden fp+ for it. We will be seeing Mickey, etc at the Visa Meet n Greet already. Don’t know how often this occurs, but we rode the finding nemo ride around 8 p.m. on Sunday, June 9th, and then tour the aquarium area. We got to meet shortly scuba diving Mickey in one of the tanks. We only caught him shortly before he was leaving. Don’t know how long he had been there. It’s pretty rare to see Scuba Mickey these days. Nice find. 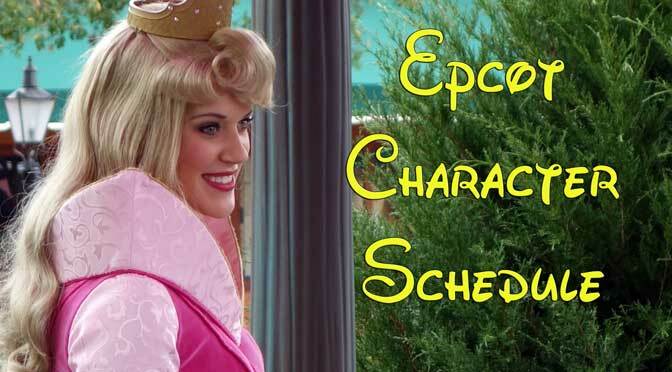 Could there be an Epcot Characterpalooza? At roughly 3:30 today (June 11, 2013) my wife and daughter were walking through the American Experience (near the funnell cake stand) and a large group of characters came out for a meet and greet. The group included Gideon, Baloo, Bere Bear, Stitch, Mickey, Sailor Donald, Pluto, Chip & Dale, and Pooh. Possibly others. There was a training meet with Mickey and Sailor Donald earlier in the week as well, but it was around noon time. I can’t list training meets on the schedules because they happen randomly. Thx for the updates! The site is “Disney Character Central” but I found a lot of the info wrong for Disneyland when we went last year so you are probably correct. Certainly want to offend them, but their site is more of “Here’s our travels, follow along.” I try to focus on making sure you have info to plan in addition to sharing my stories. Love this site. Much better and more informative than some of the other sites I have used before. We’re going to try some of your character touring plans. I can’t wait to see some of the characters California doesn’t have. Any special advice on Belle & Beast? We LOVE Belle (never seen her in her blue outfit) & have never seen Beast before. Is he truly only found at “Be Our Guest”? I also see on your site Jiminey Cricket is retired (the other site I used to use still shows him meeting at Rafiki’s Oasis (or something like that). Does that mean he never shows or is he ever a possibility? Yes Beast is only at Be Our Guest for dinner. You can see that I update the information regularly because the date is on there. Not sure what other site you use, but it’s wrong. Jiminy has been gone since December 3, 2011. Looks like that site doesn’t keep its info updated. Rafiki is the only character out at Rafiki’s Planet Watch currently. I have an accurate app for Droid and developing Mobile site for other users too. Check the Master List for an accurate idea what character is located where. Character Palooza, Frontierland Hoedown and Epcot Training are some terms you can search on my site for random/rare characters. Is there a specific time and/or place for the characters in training. Search Epcot Training on top right and you’ll find this info. Looking at the Epcot Character list and it says Mickey, Minnie, Pluto NEW Character Spot. Where is this currently located? We will be going to Disney March4-19 (not exactly sure which day for Epcot yet). I just read that Remy visits your table at Chefs de France, do you know anything about this? He is a tiny mouse that comes around to visit tables on a little cart. His schedule is on the Epcot Show Schedules. Character hotline won’t know if training characters are out or not. It only handles regularly scheduled meets. Thank you so much for all thw work you do to make these lists- but could youcome up with a one page list- I printed epcot and got 4 pages- several months ago I printed an alphabetic list and it was just 2 pages for all characters.. I recently changed the format to make it mobile phone friendly. The easiest way to reformat the data is to copy it to Excel and move the cells around.